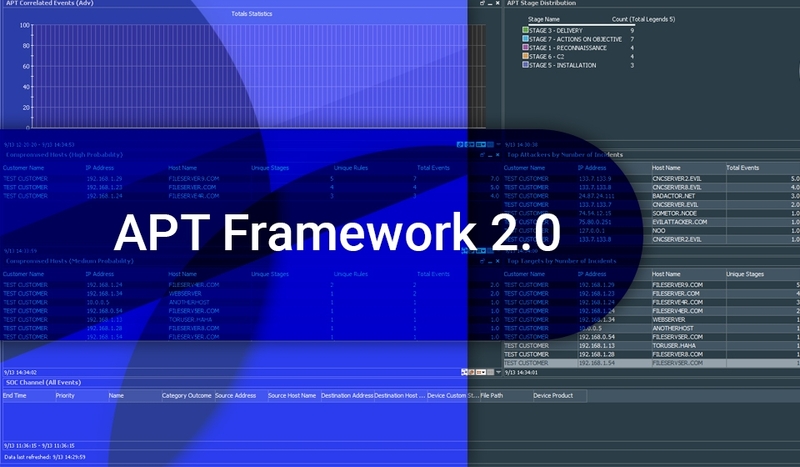 Delaware, USA – October 16, 2018 — APT Framework 2.0 for ArcSight is available in Threat Detection Marketplace. Predicting the shape of the threat landscape is a lot like meteorology. Even though the data may point to sunny skies, we aren’t too surprised when a storm rolls through instead. Similarly, the threat landscape has sudden emergences of new APT groups, well-known state-sponsored hackers exhibiting new and unforeseen techniques, and an ever increasing number of new exploit kits. Now, more than ever, organizations and government entities need an umbrella of advanced tools to protect themselves with. SOC Prime’s APT Framework adds sophistication to your existing tools by leveraging the Lockheed Martin Cyber kill chain to connect the dots between low-level SIEM incidents and link them to high-confidence compromises. The framework comes bundled with some of our latest detection rules for common TTPs and is able to integrate with your existing content for maximum visibility of your environment. With customization features for whitelisting and network modeling, you can be sure that the framework is tailored to your network. Visit SOC Prime’s booth at HPE Protect 2016!